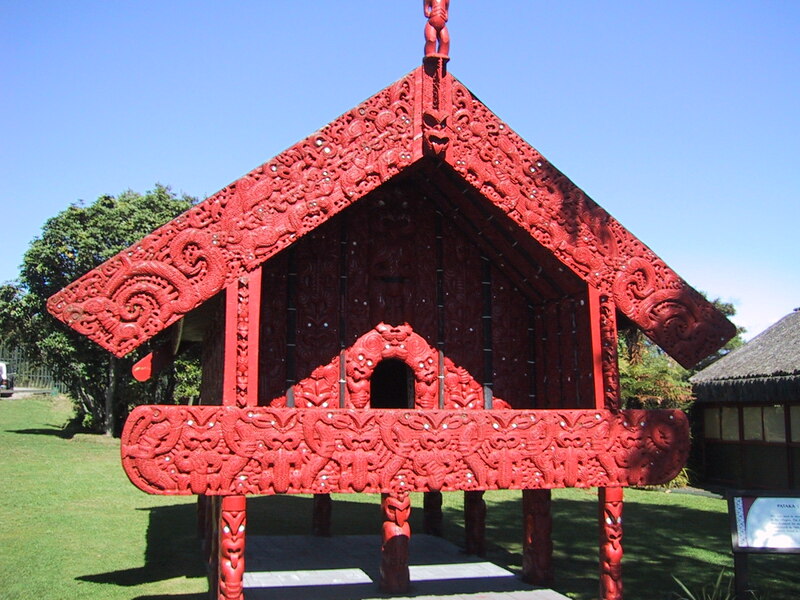 Redolent, red´ō-lent, adjective. 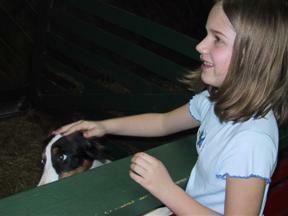 Having or diffusing a sweet scent; giving out an odor; odorous; fragrant: often with of - Redolence, red´ō-lens, noun. 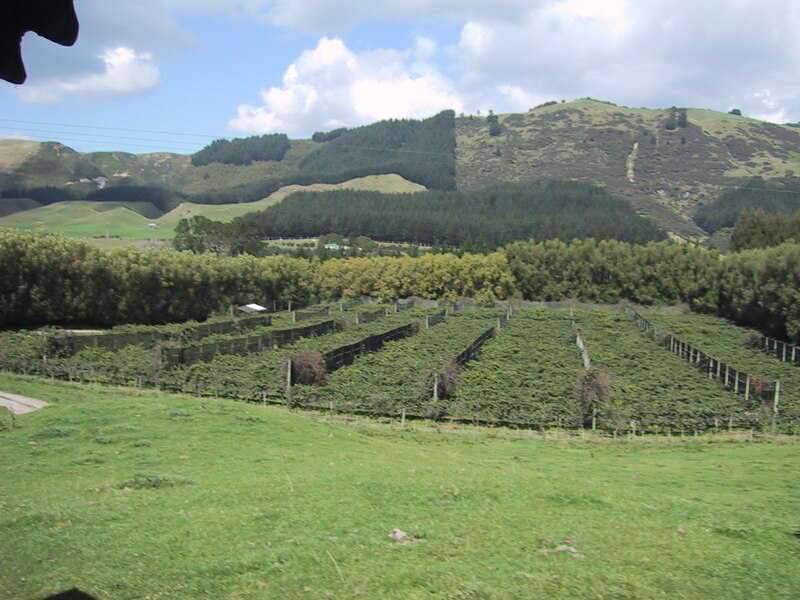 The quality of being redolent; fragrance. 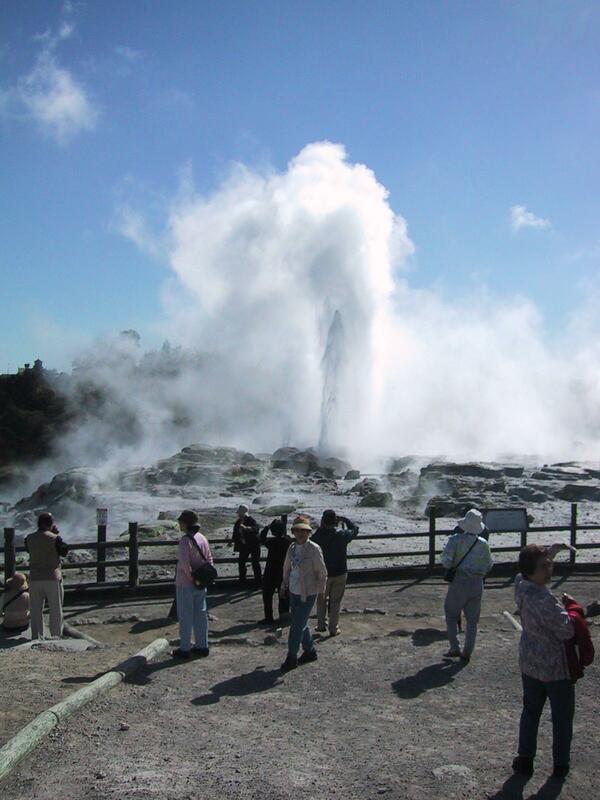 Rotorua is one of the major tourist centers of New Zealand. 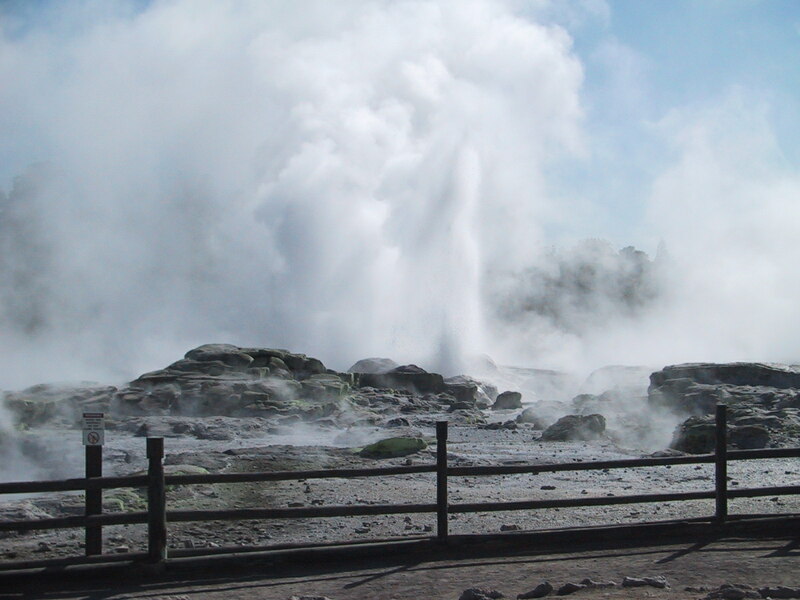 Its prime attraction is the thermal areas - much like the Orakei Korako thermal area, but larger, more commercialized, and centered around the Pohutu geyser. 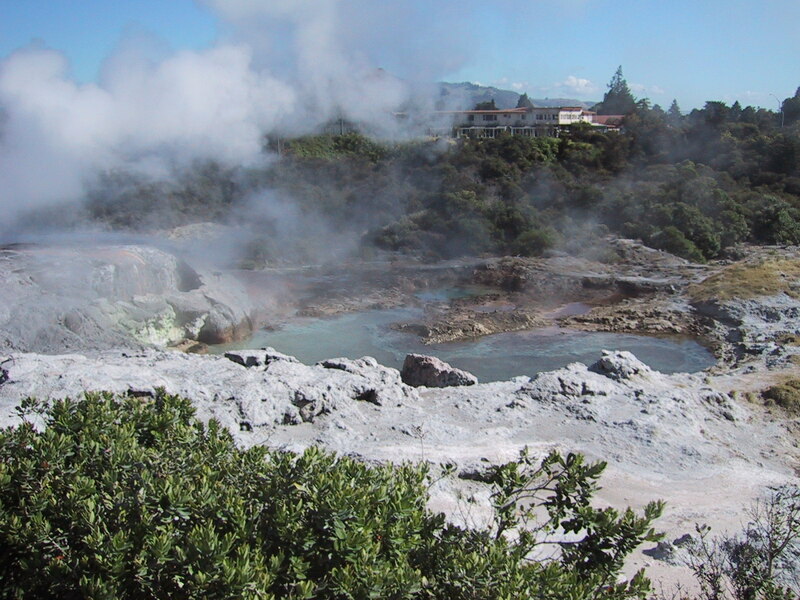 In fact, thermal areas are all around Rotorua, to the point that some homes are actually heated with water from sulphurous hot springs - some restaurants even pipe the pre-heated water in for cooking! 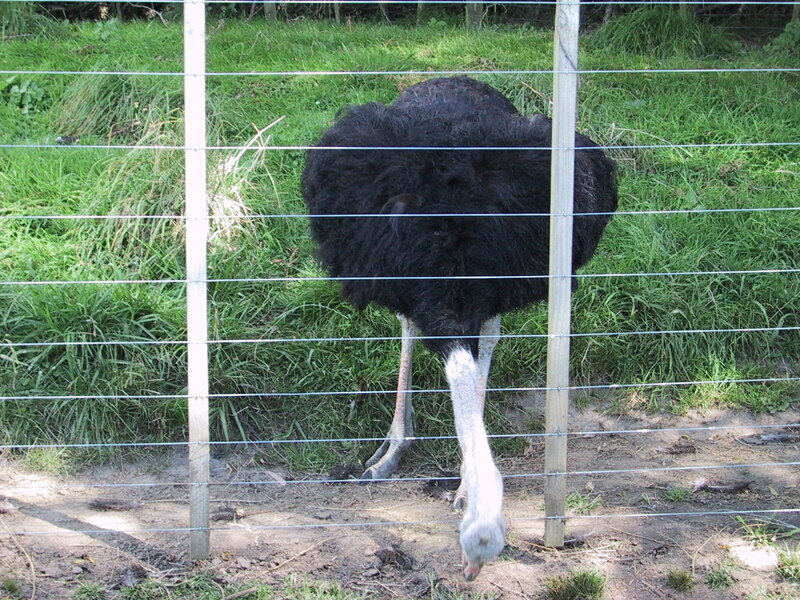 The consequence of this is a certain... smell. This is the kind of place where you can eat beans every day and no one will notice. 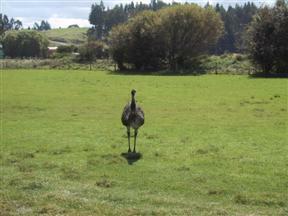 This was one of the reasons we picked Holden's Bay for our camping site - it was far enough away from Rotorua that the air was pretty fresh. The morning began early, with the first flight out of the airport. This was going to be a very touristy day for us, seeing all sorts of sights. 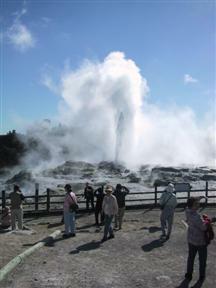 The first stop, the Pohutu geyser. 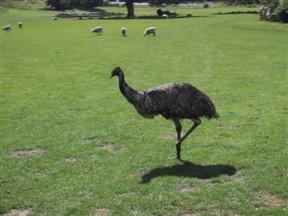 The area is setup for lots of tourists, and even though its late in the season, they've come in droves. 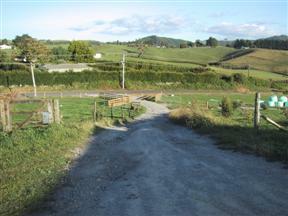 Lots of campers and regular cars fill the parking lot, and its not even 10am! 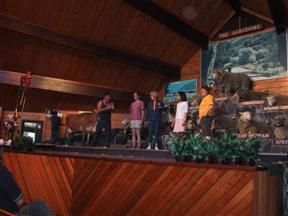 And then there are the gigantic bus loads of Japanese tourists. 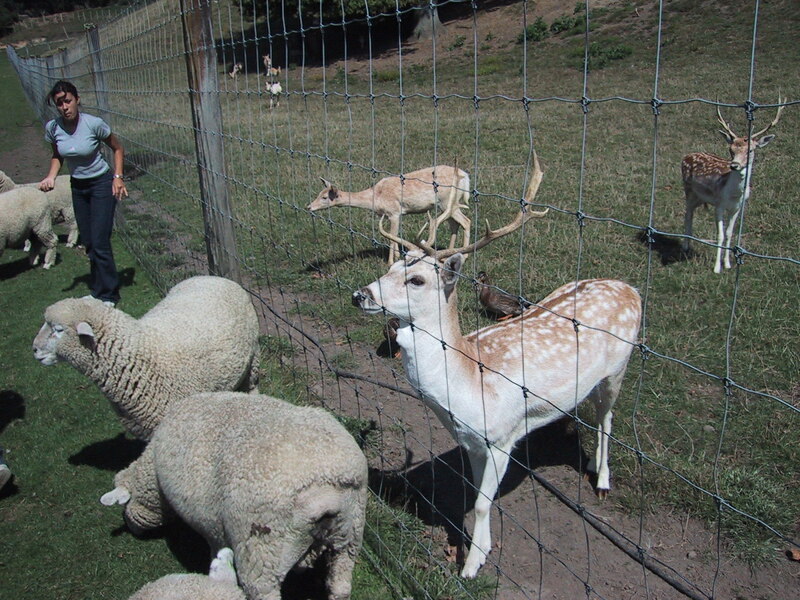 They all wear walkman like devices to hear their tour guide translate signs and explain the sights. At the entrance gate to the thermal area walking paths. 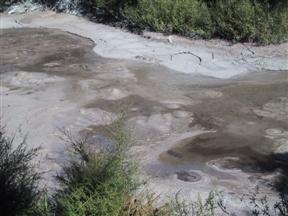 Along the way to the geyser, we encounter boiling mud pools - they seem dryer than yesterday's mud pools, making little volcanoes. 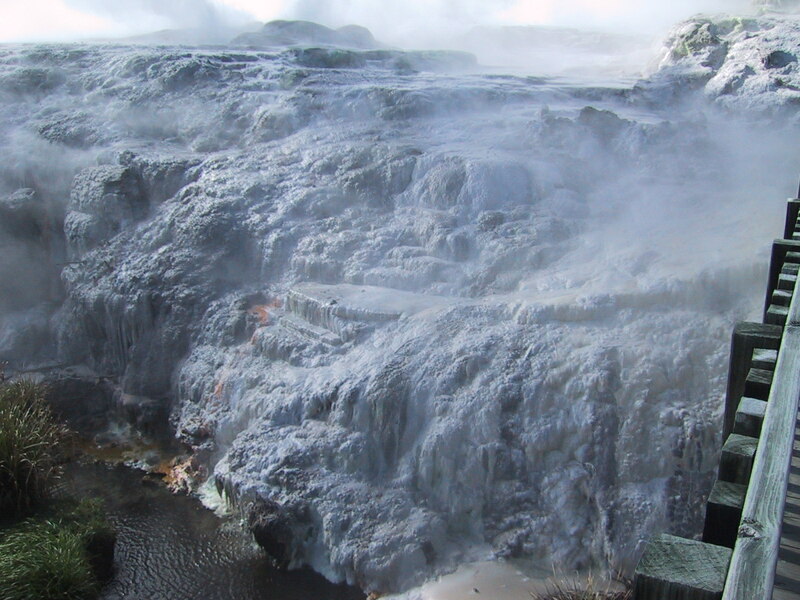 Crossing the bridge toward the geyser, there's a massive silicate terrace that stretches into the river. 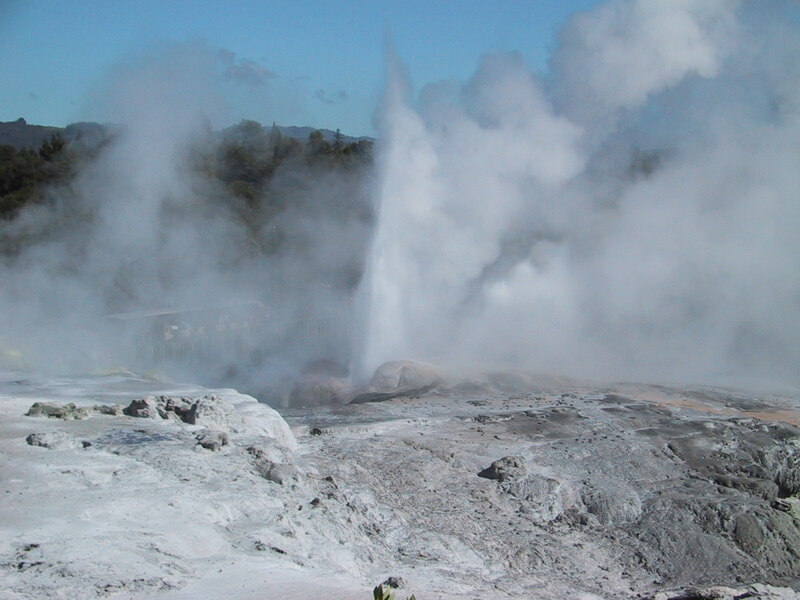 Our first look at the geyser, actually two - on the right, Pohutu, on the left, the Prince of Wales geyser, so named for its similarity in shape to the feather in the Prince of Wales crest. 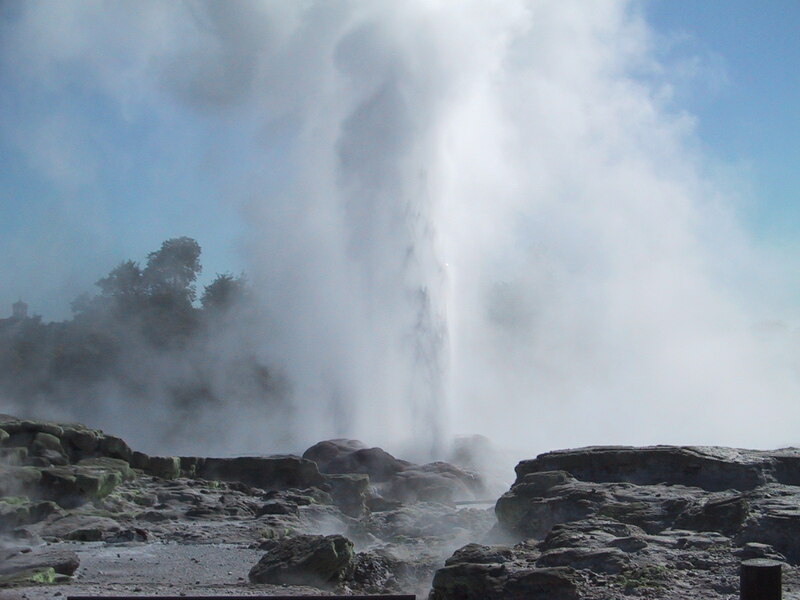 While the geysers pump out a certain amount of water and steam all the time, there are also real "eruptions", that occur every 30-60 minutes. When these occur, water is shot high up into the air by the Pohutu geyser: as much as 20 meters. 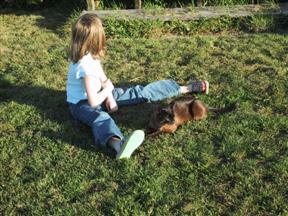 In anticipation of such an event, we sat in the sun and watched the water bubble. 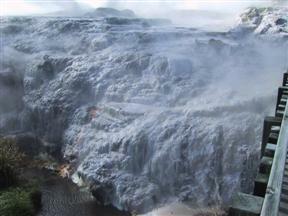 All around us were Japanese tourists and clouds of sulphurous steam from the innumerable vents. It wasn't long before our patience was rewarded. A first photo, as the noise of the geyser begins to increase, steam billows. A serious shot of water into the air, at least 30 feet. A close up view of the eruption from the viewing area. 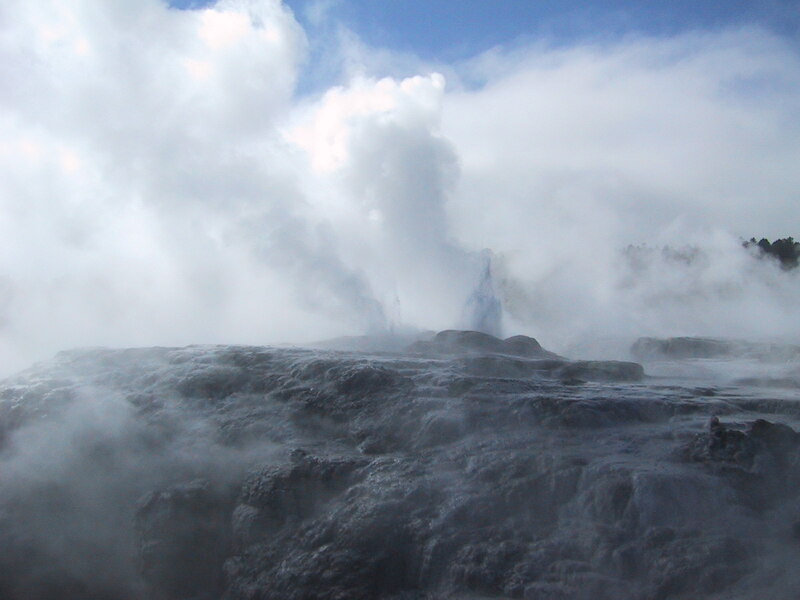 After walking around the geyser area, we found a clearer shot of the eruption, with the wind carrying the steam away from the geyser. All around the geyser, steam rose from holes in the rock. 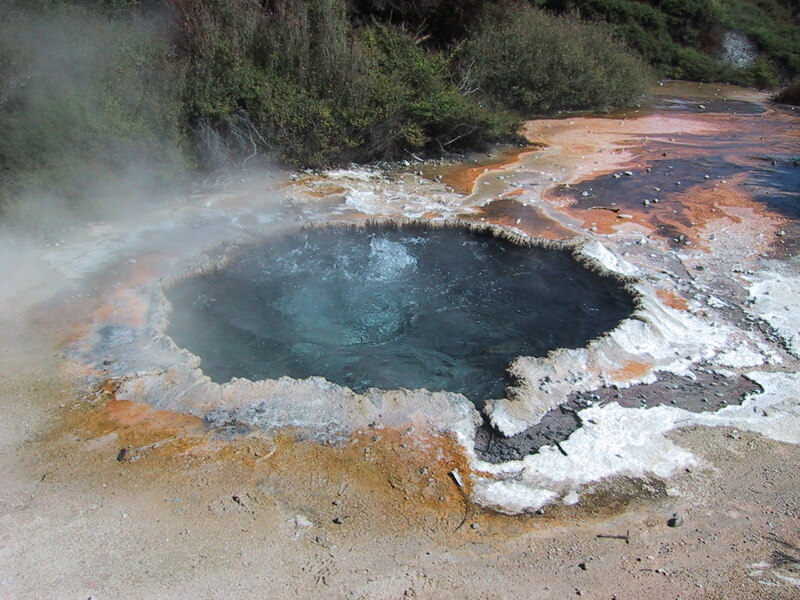 The holes themselves are often quite yellow - sulphur is being constantly deposited from under the earth onto the surface through the steam. We wandered from the geysers down the path around the entire thermal area. 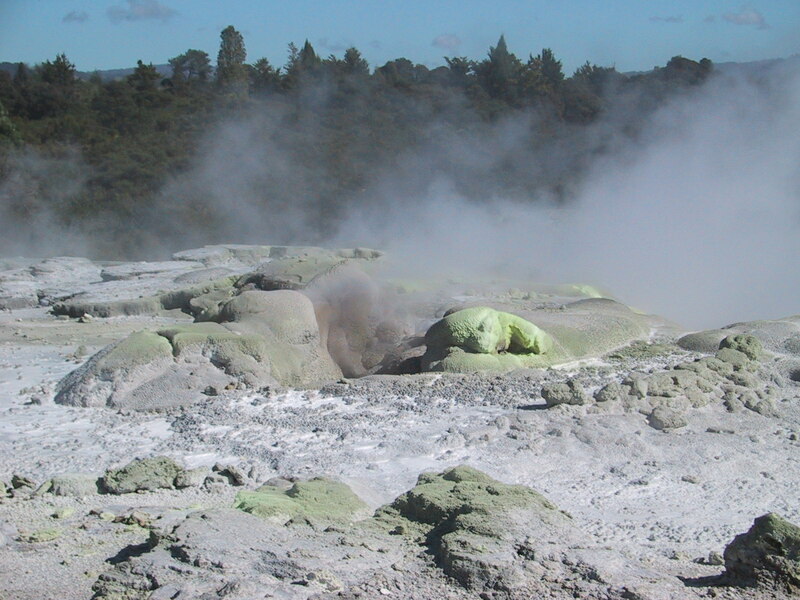 These are steam holes right near the geyser itself, you can see how yellow the rocks are. And that steam carries all over Rotorua... A view off the geyser terrace into the river, the geysers themselves are off to the left. 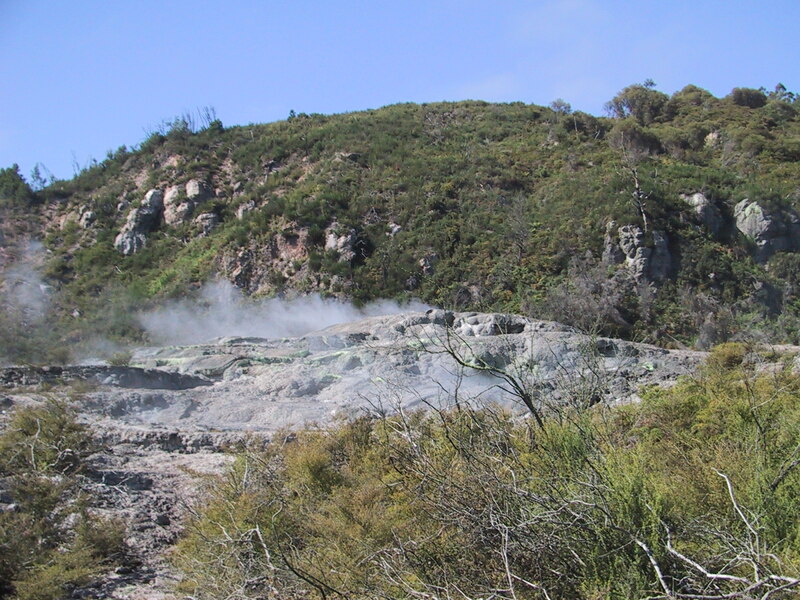 This is the site of a large geyser that stopped erupting back in the 1970s, attributed in large to an increase in the use of thermal water in Rotorua. 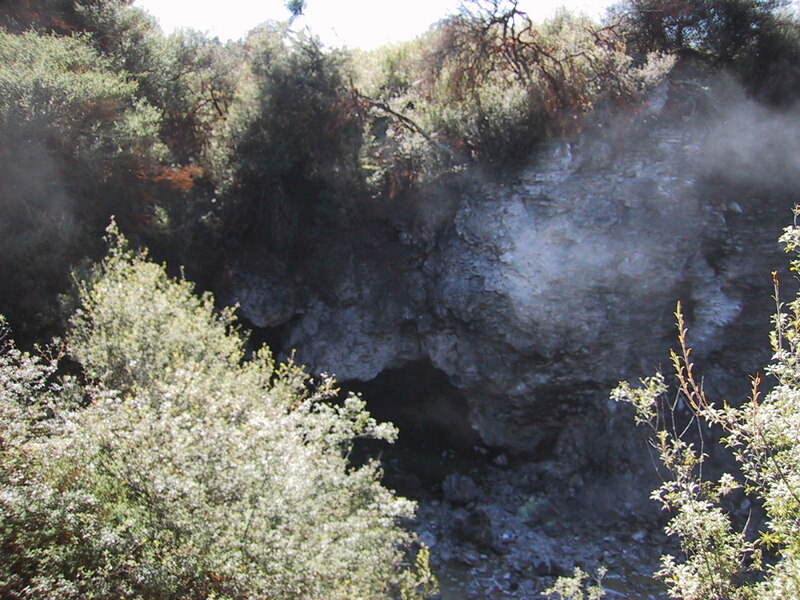 All over the thermal area, small caves and holes gurgle and burp stinky steam. 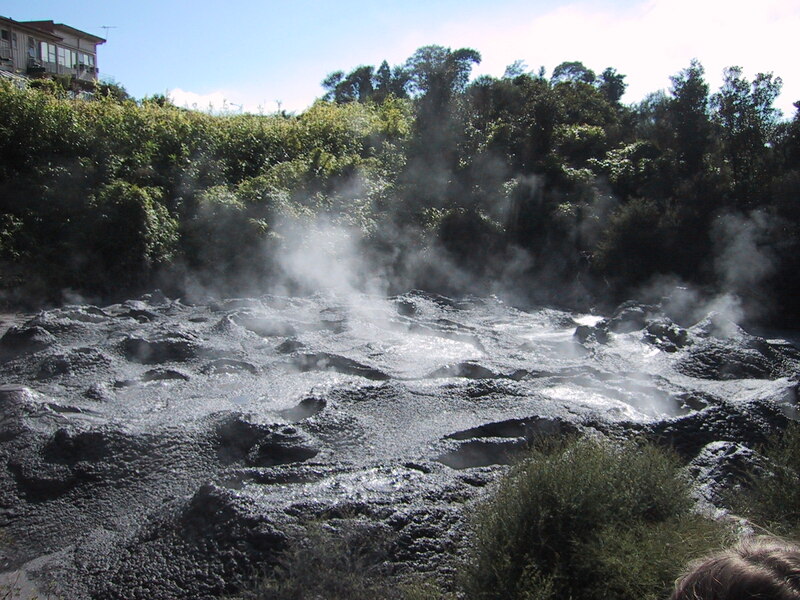 A large boiling mud pool, and especially smelly for some reason. 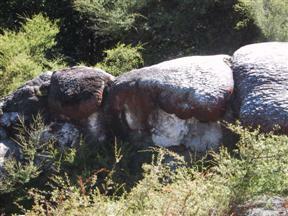 Another dead geyser, this one erupted almost continuously until the 1970s. One of the most famous attractions at the thermal area is a "cooking pool", used by the Maori to cook food. Beside the pool is a hut and wooden crane. 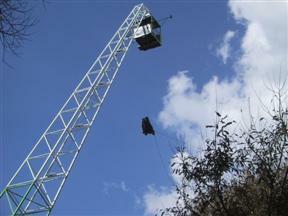 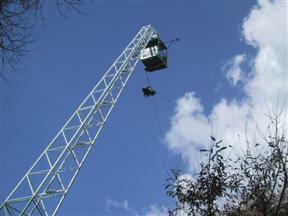 Food is bundled up in leaves and tied to the crane, then swung out over the pool, lowered in and cooked. 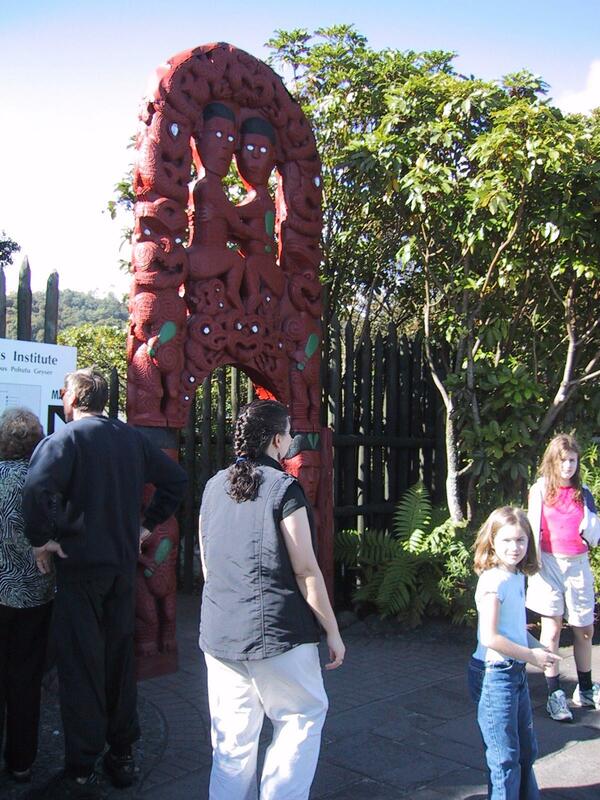 This is only one of many Maori related structures in the area - the Maori had villages around these thermal areas long before Europeans arrived in New Zealand. The Maori cooking pool, boiling away. The silicates in the water have built up a rim that makes it very pot-like. 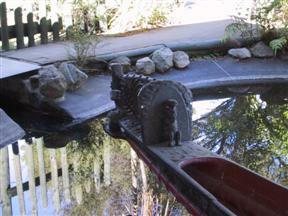 The water runs down the rocks into the river. 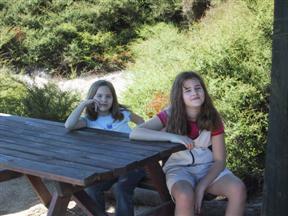 The girls look terribly impressed at the cooking pot. 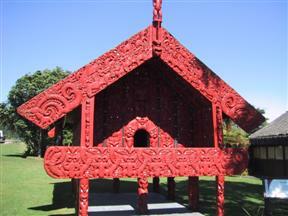 In the Maori display area, a huge war canoe sits out. 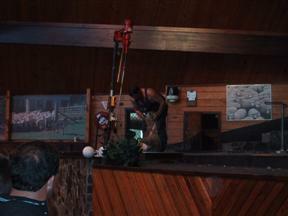 This is a look at the stern. 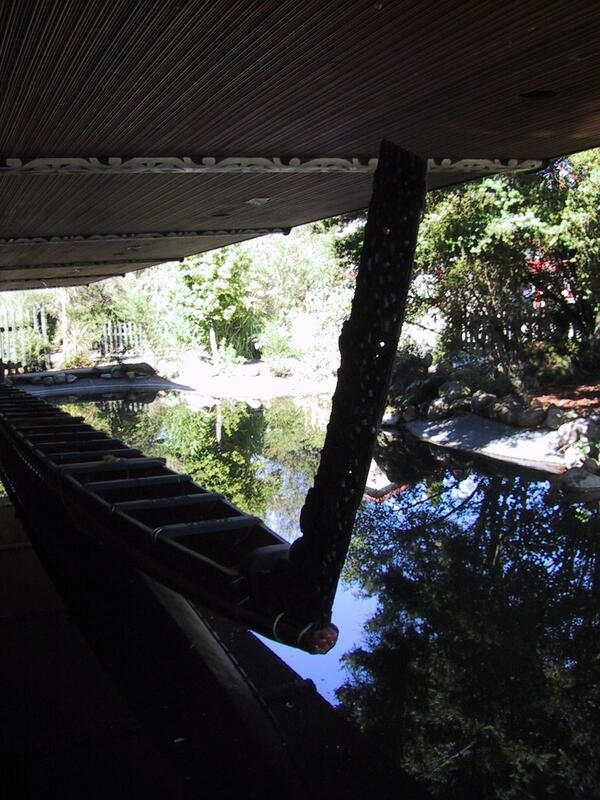 And this is the bow... the canoe would easily seat thirty. 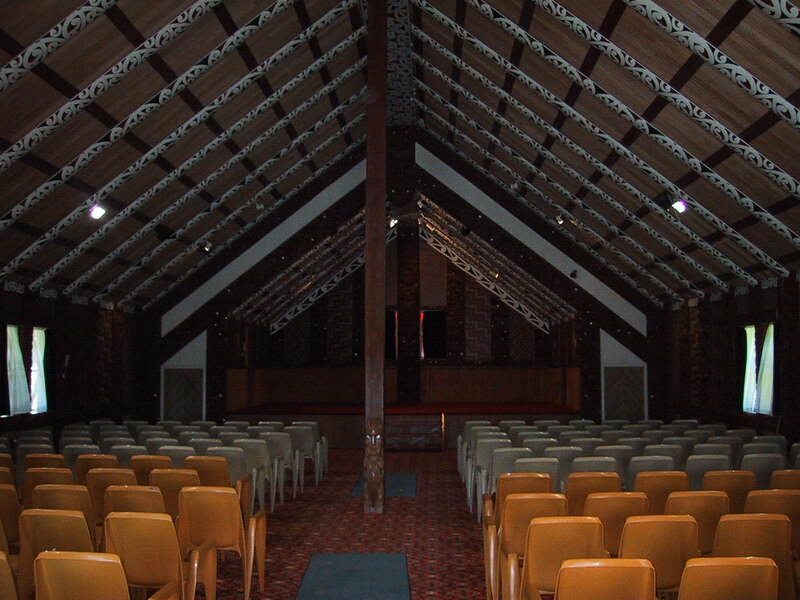 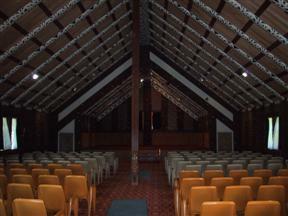 In the Maori village, we get a look inside the large meeting house. 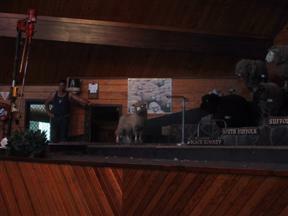 Beside the big house, a smaller storage house... the caption beside the house indicates that it was originally built in 1906! 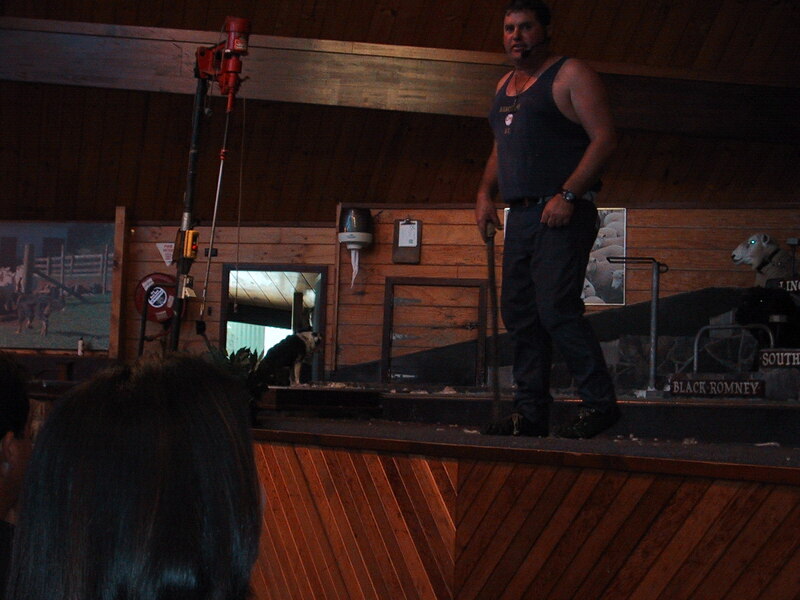 That was the end of our tour around the thermal area... from there we raced off to the Agrodome, arriving just in time for the 12:10 show. 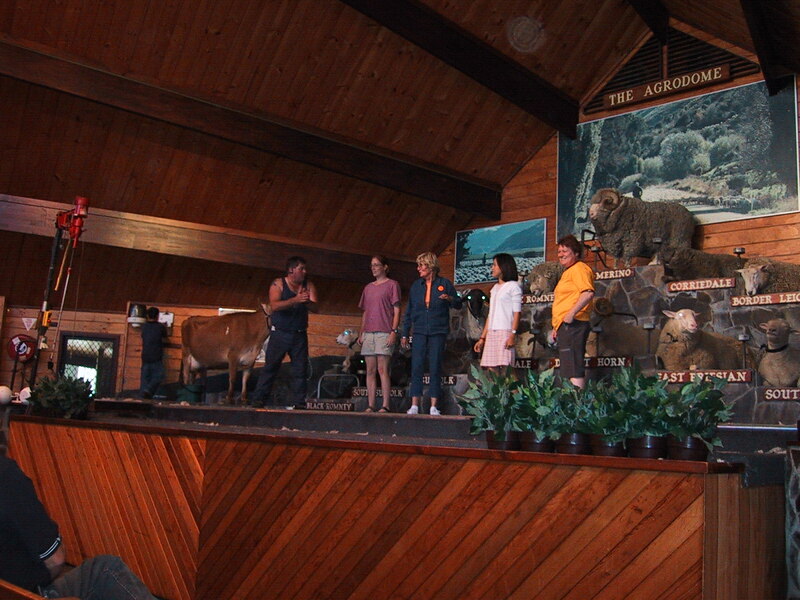 The Agrodome is a demonstration farm, showing off techniques for raising all sorts of crops and animals. 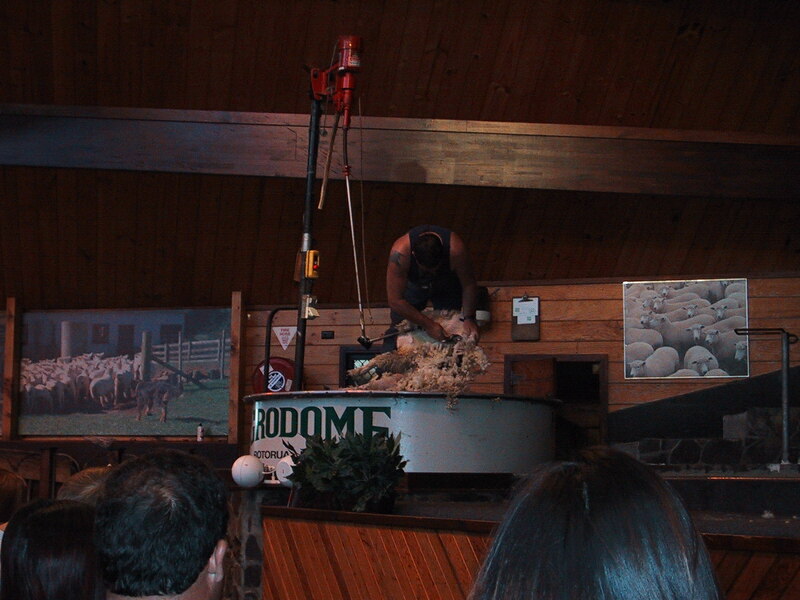 It was originally focused on sheep raising and shearing. 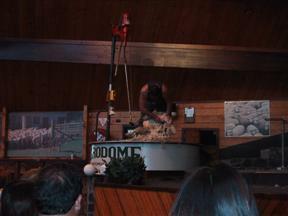 It was a Kiwi who developed the modern methods of sheep shearing, and it was put on display at a world's fair in Japan. 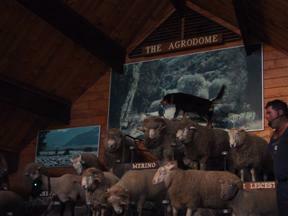 It was so successful that he was asked to set up a training school to teach sheep shearing methodology - and the Agrodome was born. The show begins with an introduction to nineteen different breeds of sheep that are (or were) raised in New Zealand. 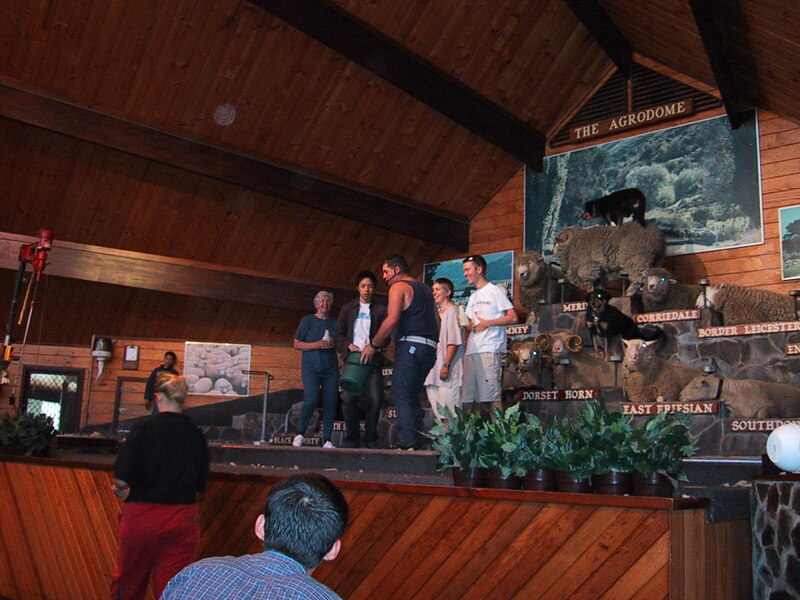 A champion ram of each species is brought up on stage and tethered in place. The process is entertaining and informative, a few of the rams are old hands at the process and are quite sneaky. A two shot panorama of the entire group of sheep on display... ...here's the other half. 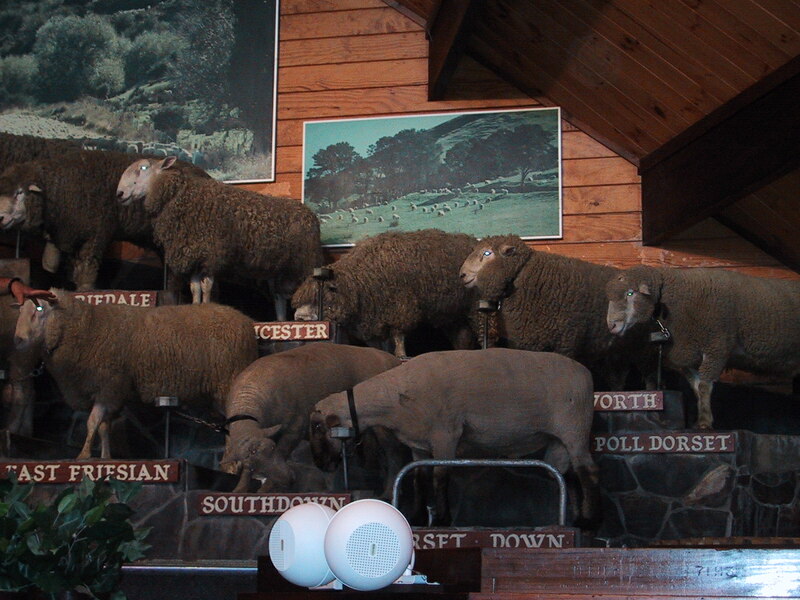 Mostly wool sheep, there's also meat and milk sheep. 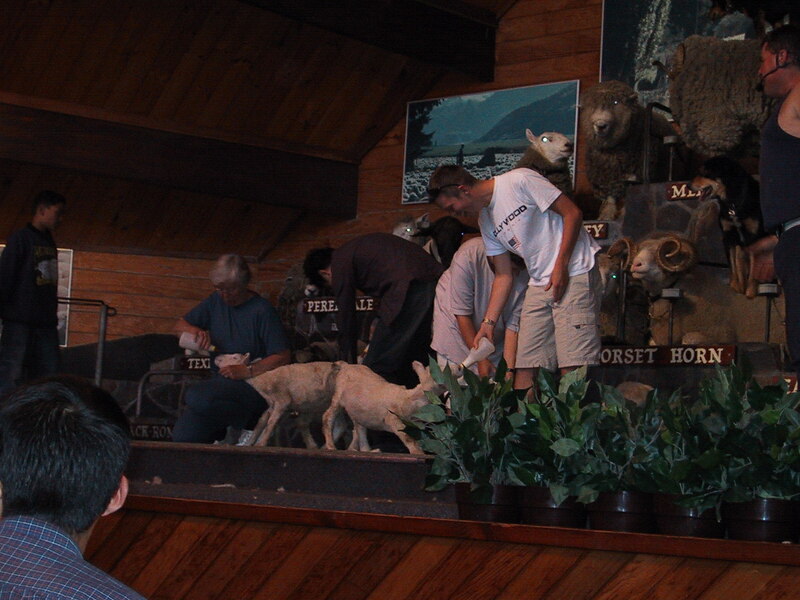 The next part of the show was a sheep shearing demonstration... everyone figured he would shear one of the rams (and he alluded to such), but then a door on the edge of the stage opened up and a totally freaked out young sheep wandered onto the stage. 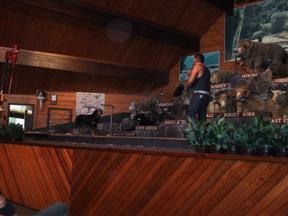 And now, his first time on stage anywhere... After a few moments of wandering around aimlessly, our host takes charge. 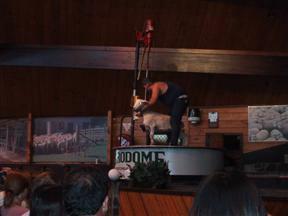 A naked sheep in less than two minutes! 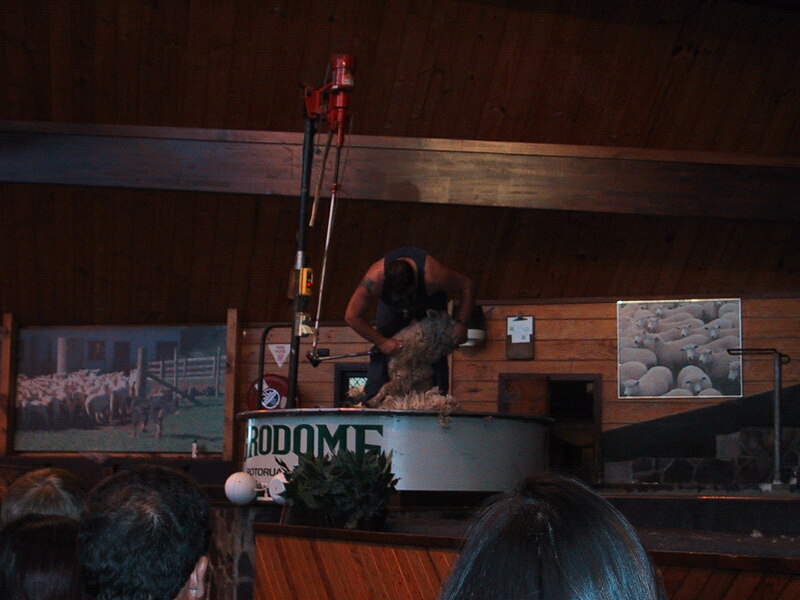 From here, the host threw handfuls of the freshly sheared wool to the audience to inspect. 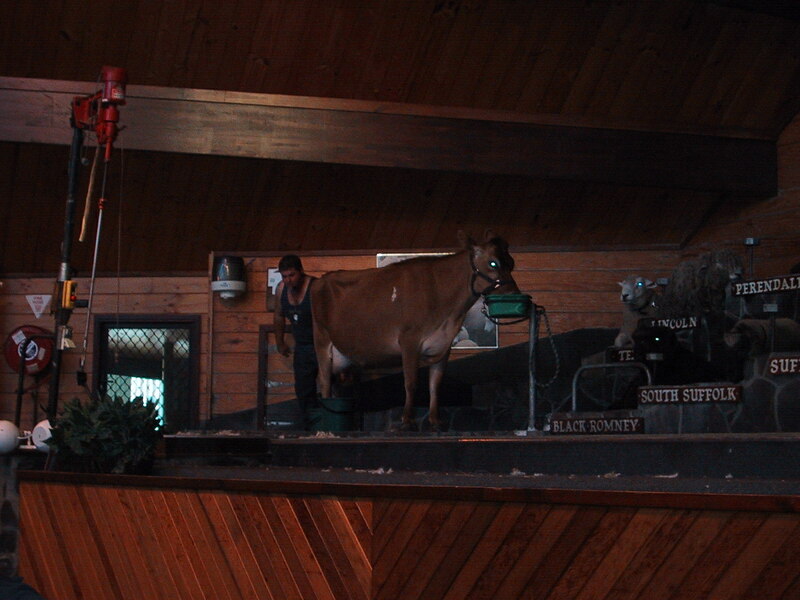 The next part of the show... milking a cow! 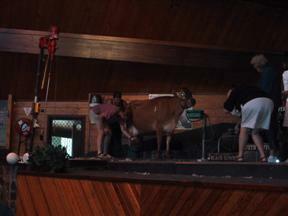 The assistant brings a cow out on the stage, the host rounds up four volunteers to attempt milking the cow. 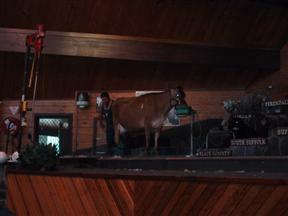 The cow settles in with a bit to eat. The four contestants get a bit of group humiliation and milking training. Contestant #1 makes it look easy. 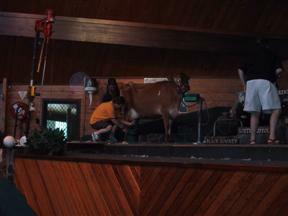 Contestant #2 manages to get a bit of milk out. 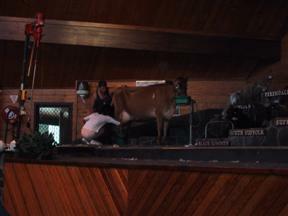 Contestant #3 seemed more interested in petting the cow than milking it. 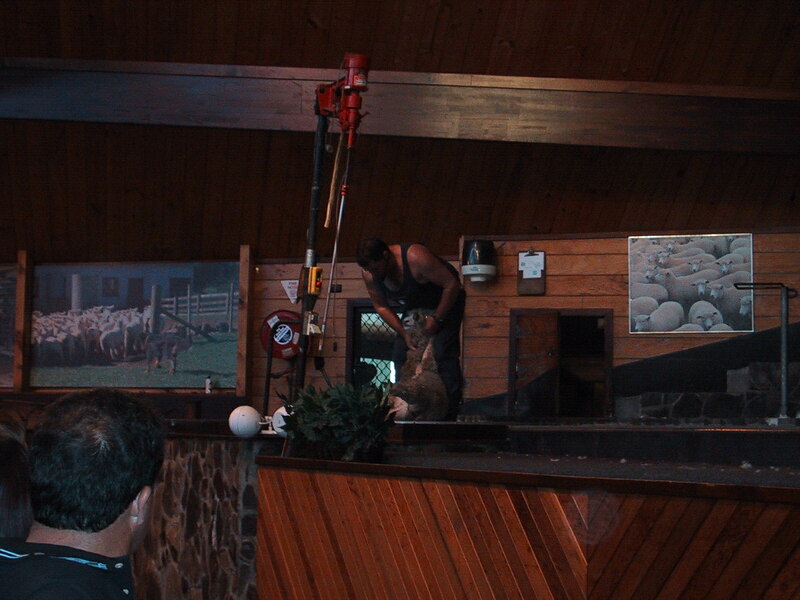 Contestant #4 had obviously done this before. 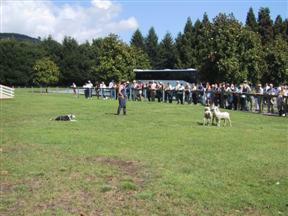 Next up... the sheep dogs! New Zealand has its own unique breed of sheep dog, known as the huntaway. 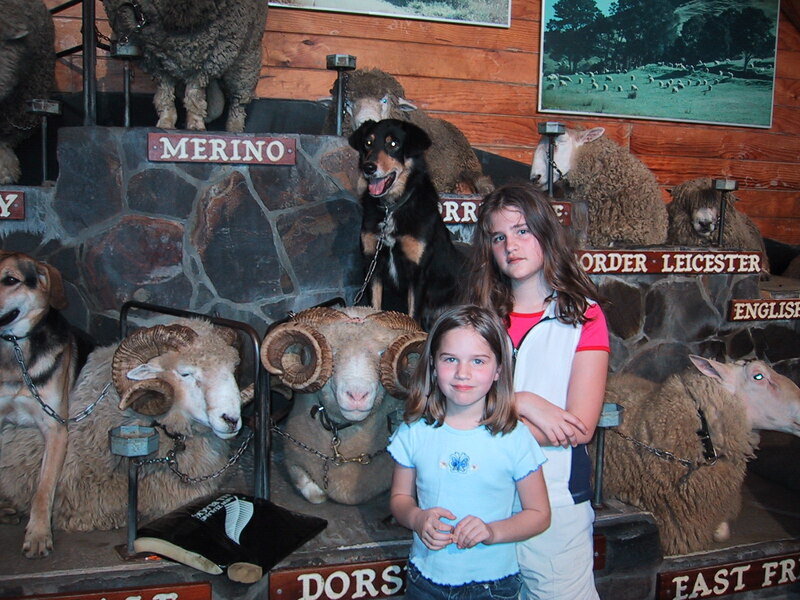 Its a cross between a border collie (that famous English sheep herding dog) and a bloodhound. 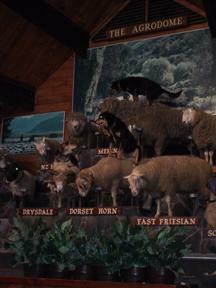 The result is a larger dog that barks endlessly, but is larger and more robust, able to stand up to the rugged New Zealand hills that are used for sheep herding. After demonstrating with a single dog, suddenly two more came racing up on stage and began to run over the sheep, around and around. The rams were utterly unfazed, even when the dogs came to a stop on top of the sheep. Our host introduces us to the huntaway sheep herding dog. 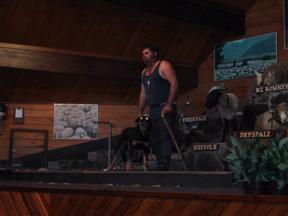 The dog follows his master's direction, even racing through the seats of the audience! 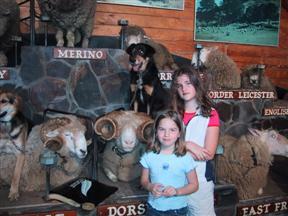 The first dog comes to a stop on the back of the merino ram. 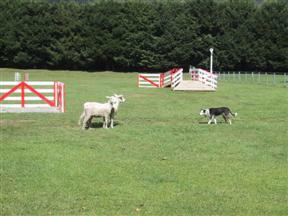 The other two dogs stop on two more rams, merrily barking away. The next dog out is a "strong eye" dog... a border collie, he didn't bark at all, just stared down the animals to herd them. And what was he herding? 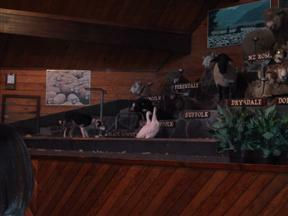 Ducks! 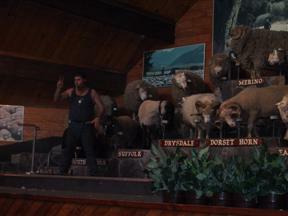 The final part of the show involves four more volunteers... ...to feed hungry lambs! 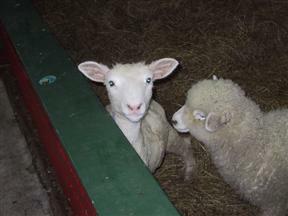 ...and more lambs! 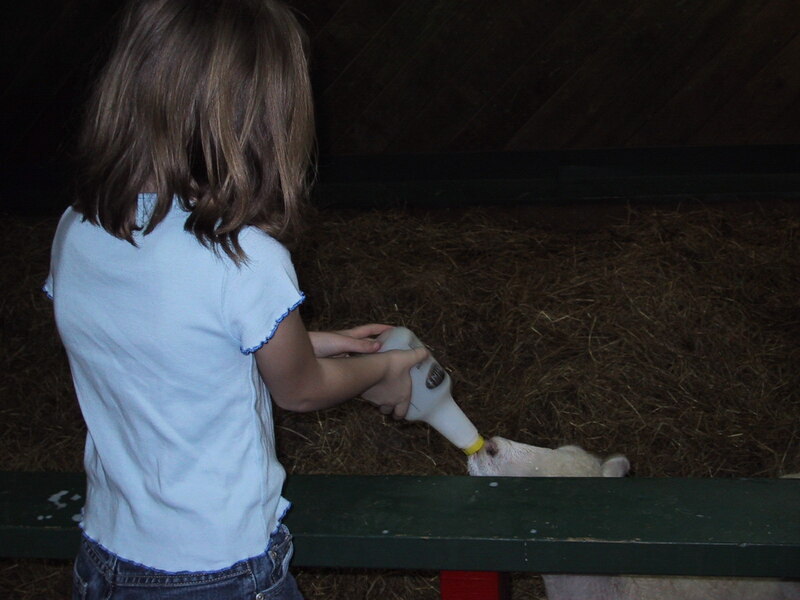 Hey dude, got milk? 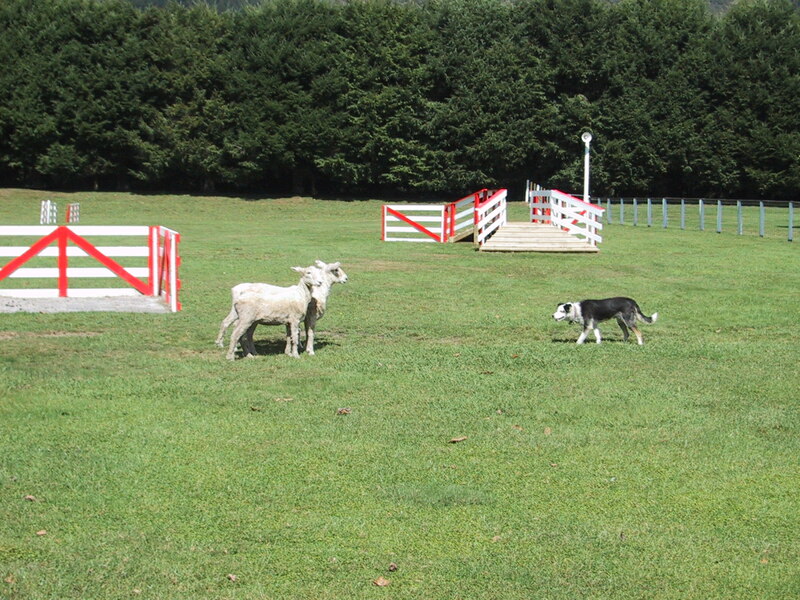 Outside, the show with the strong eye dog continues, as he directs four lambs into a corral. Even after the show is over, all the dog wants to do is herd sheep. 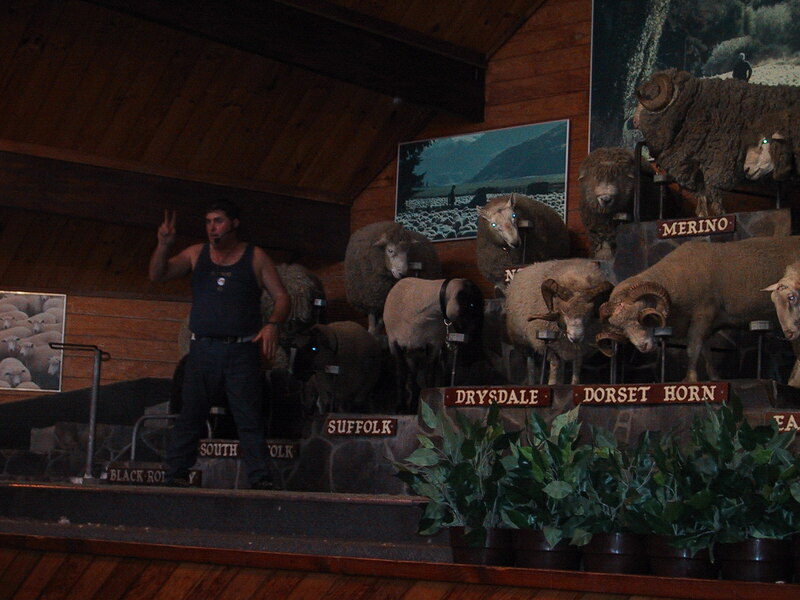 The sheep show over, we boarded a farm tour, a tractor pulling a large wagon full of rows of bench seats. 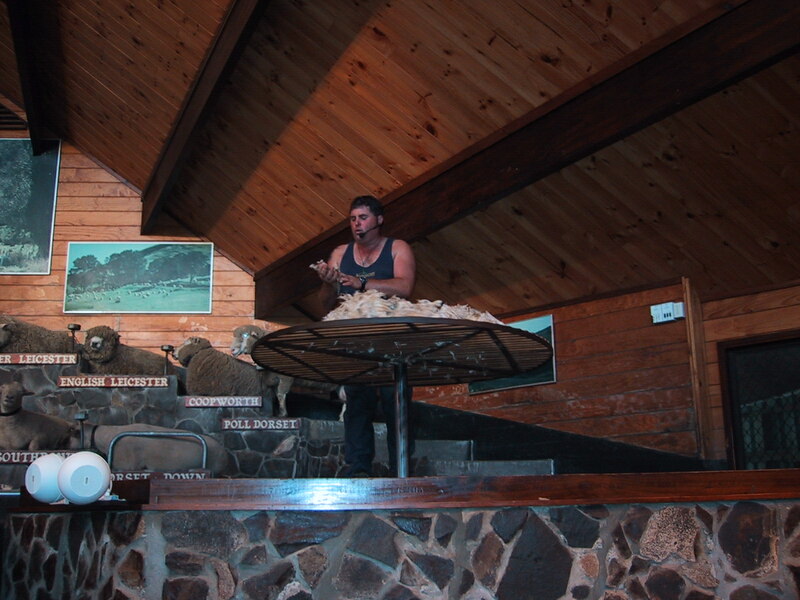 Our driver, John, gave running commentary about the farm and the different things that it did, well above and beyond a typical cattle or sheep farm. Nope, not llamas, these are alpacas, relatives of llamas (and camels). They're raised for their wool, which isn't as strong as wool, but much warmer and lighter. 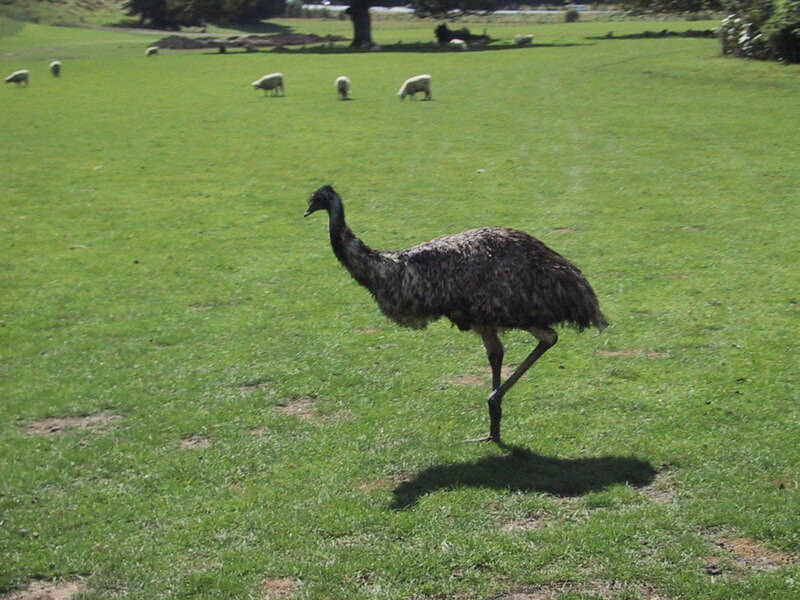 Check out the emu! 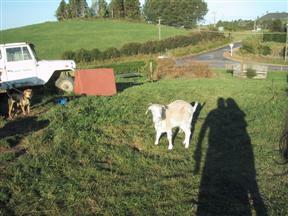 As we moved into a large paddock, a herd of sheep, ducks, even a pig started chasing after the tractor and wagon. 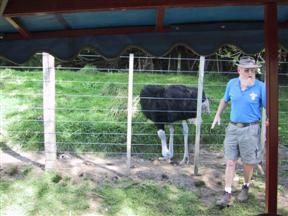 We eventually stopped and were able to climb off the wagon and feed the animals handfuls of pellets dished out by John. 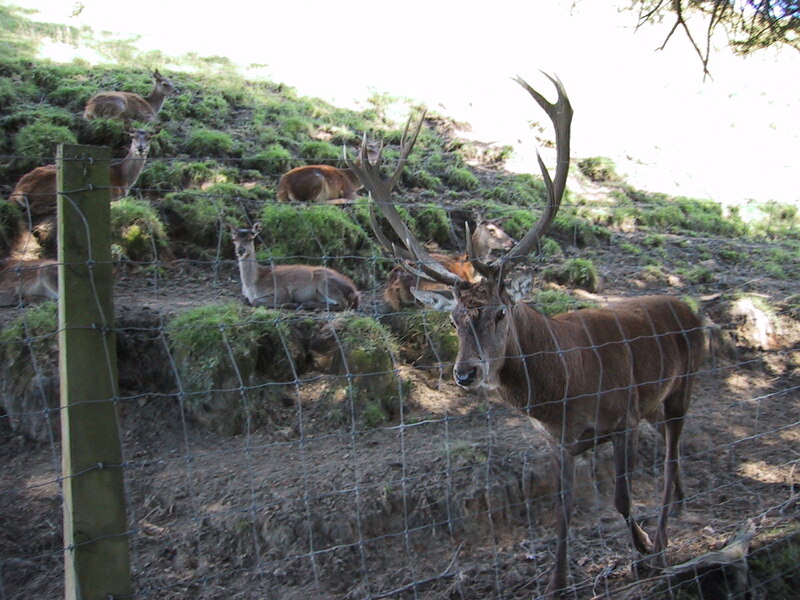 Where we stopped was right beside the fencing of two more paddocks, one with fallow deer and the other with red deer. 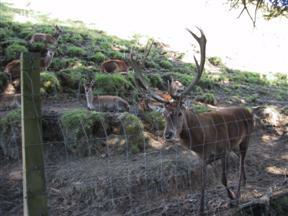 The red deer head for the fence to get fed. 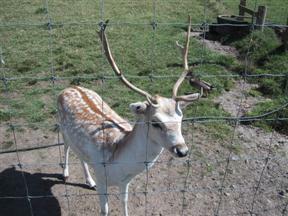 The fallow deer, shy at first, finally came around for something to eat. 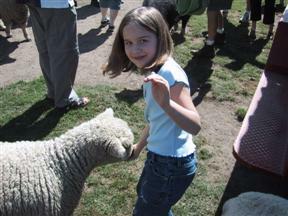 The sheep had no restraint at all, actually taking to butting people in the rear end to encourage rapid feeding. A close up look at the fallow buck, maybe four foot tall at the top of the head. 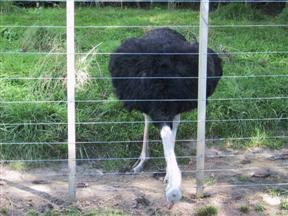 Caitlin, a bit banged up from the aggressive sheep, but still game to feeding and dodging piles of poop. Back on the train, we pass the rest of the herd of red deer, the stag was a bit anxious. 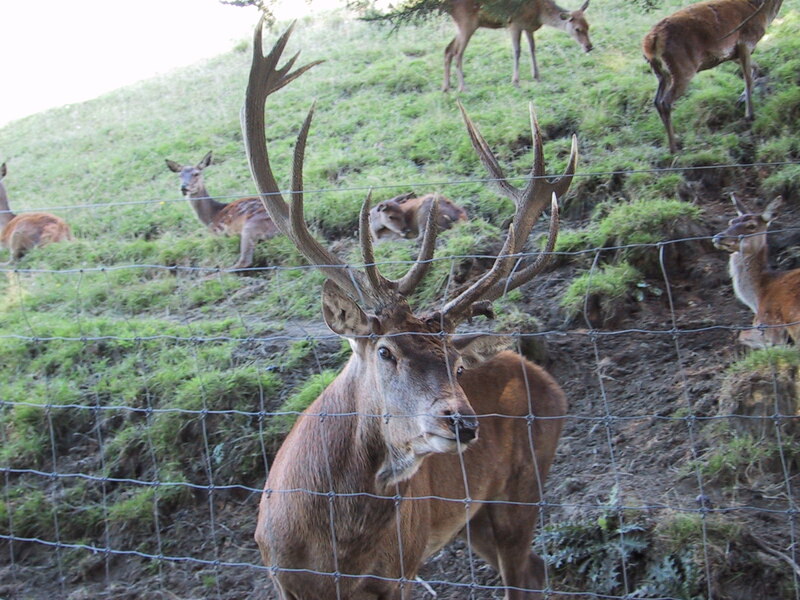 It was coming into rut, after all. 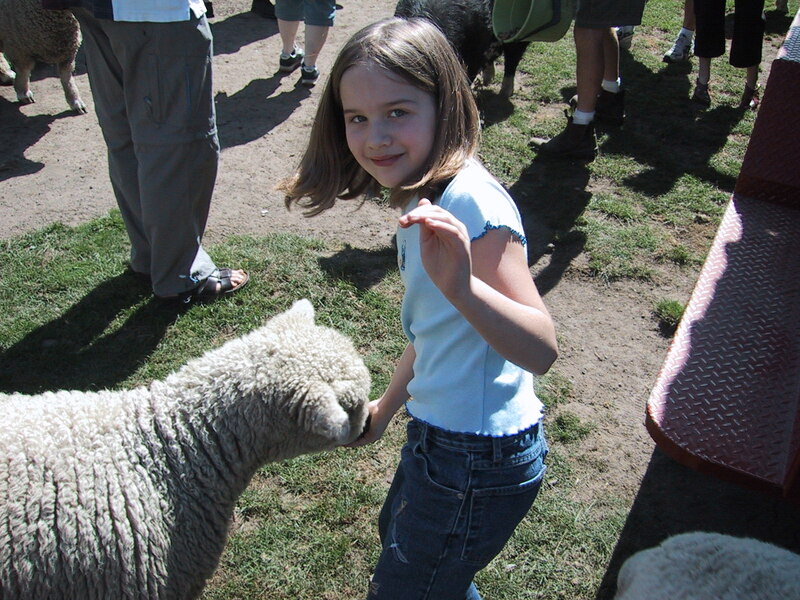 Yeah, c'mere and say that! 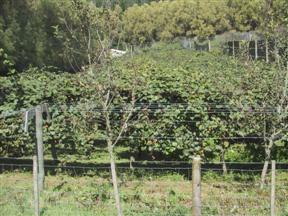 Further on, we pass a kiwi fruit orchard. 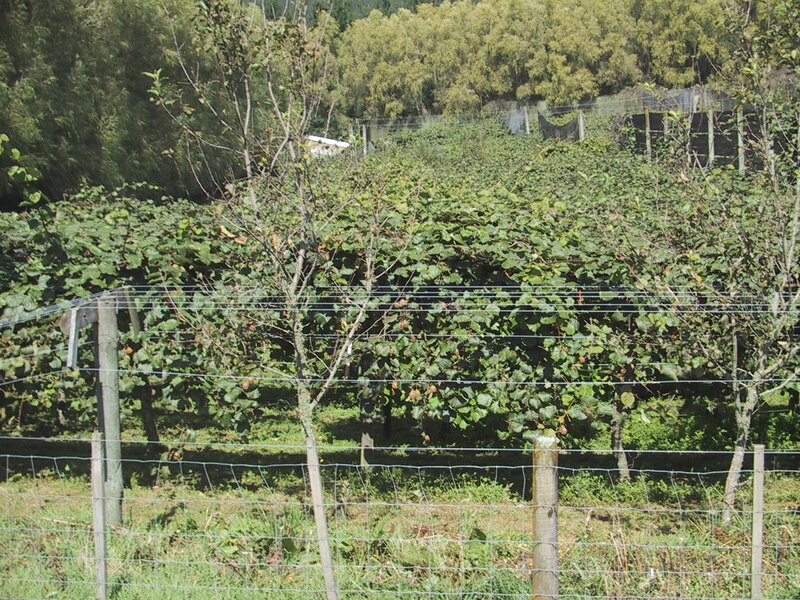 Up close, you can see that the kiwi actually grow on a vine, not a tree, and is held up by trellises in the orchard. 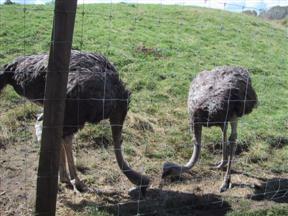 A pair of female ostriches, new to the farm, are penned away from the male. On the other side of the train, John introduces us to the male. Ostrich meat is in big demand, although ostriches are difficult to care for. 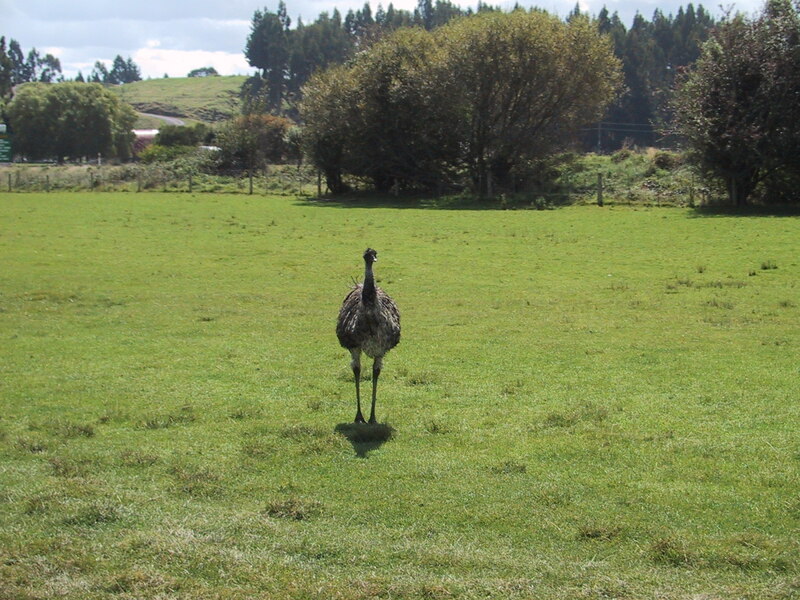 The emu is smaller, but you can raise twice as many in the same area. On the last bit of the tour, John brought us past a few of the rides on the property, including this triple bungy jump - three people at once, in a kind of sleeping bag. 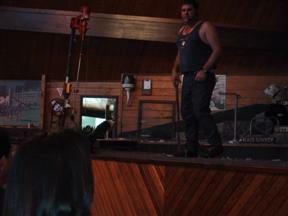 There was a lot of screaming at this moment. That was the end of our tour of the Agrodome, and the end of our touristing around Rotorua. 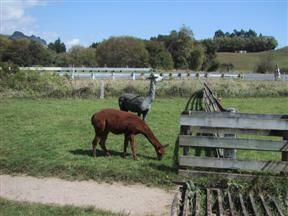 It was time to drive to Tauranga. 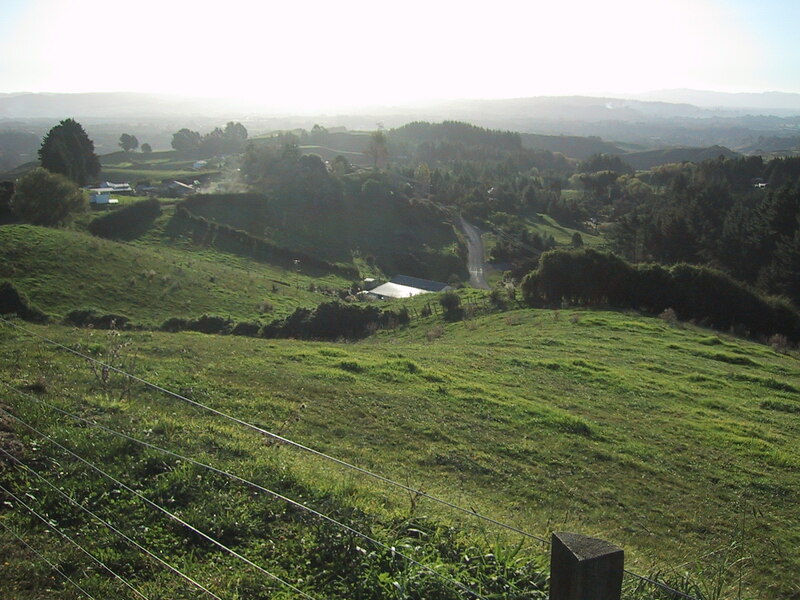 Last time we were in New Zealand, we had driven a small back road from Tauranga to Rotorua, but that wasn't going to be a good idea in the big camper. 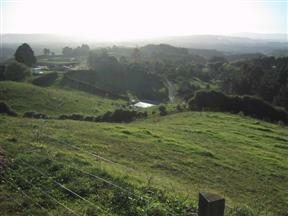 We took the main highway and in only an hour or so we were in Tauranga. The double roundabout left and right hand turn got us back on Ohauiti Road on the way back to the farm. 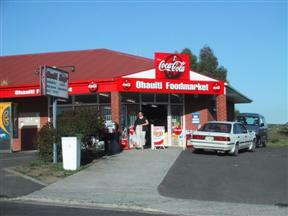 Stacy makes a quick stop at the local grocery before we get to the farm. 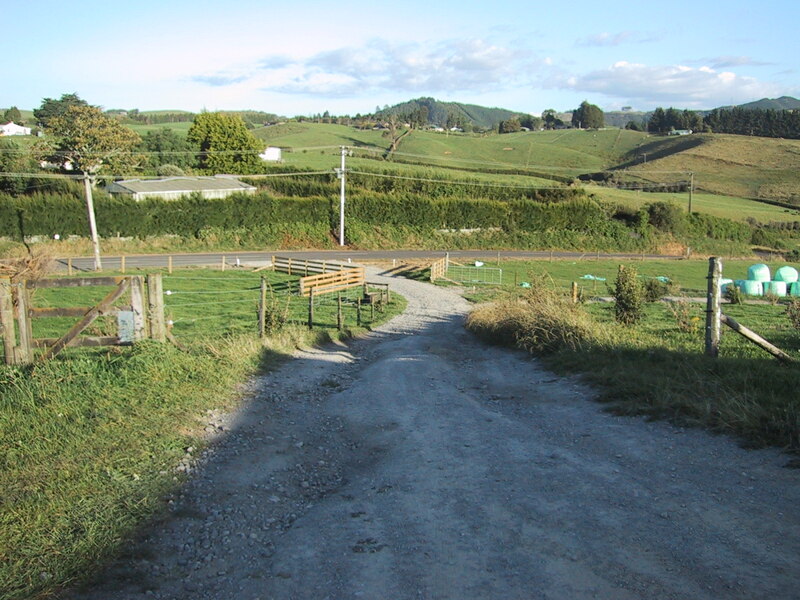 At the farm, we look back down the steep and rutted drive way we managed to run the camper up. 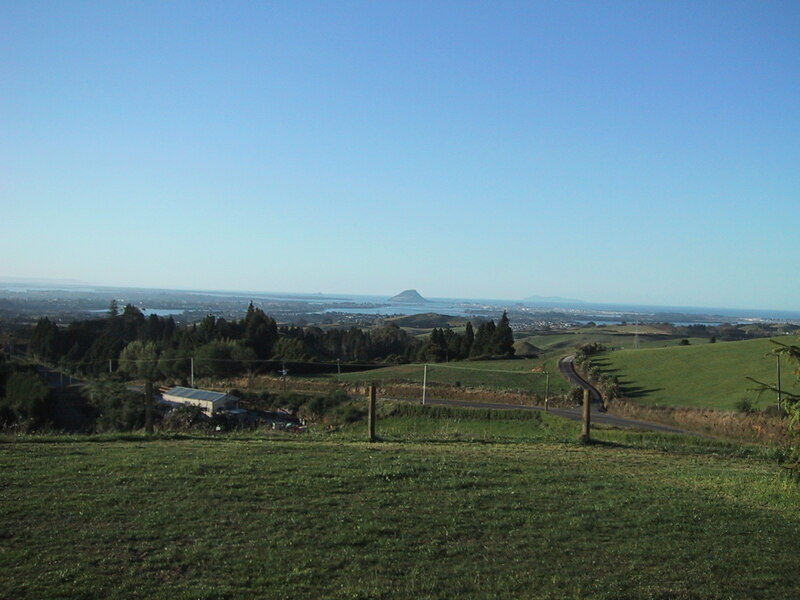 A look from the farm, in the blue sky, over Tauranga to Mount Manganui. 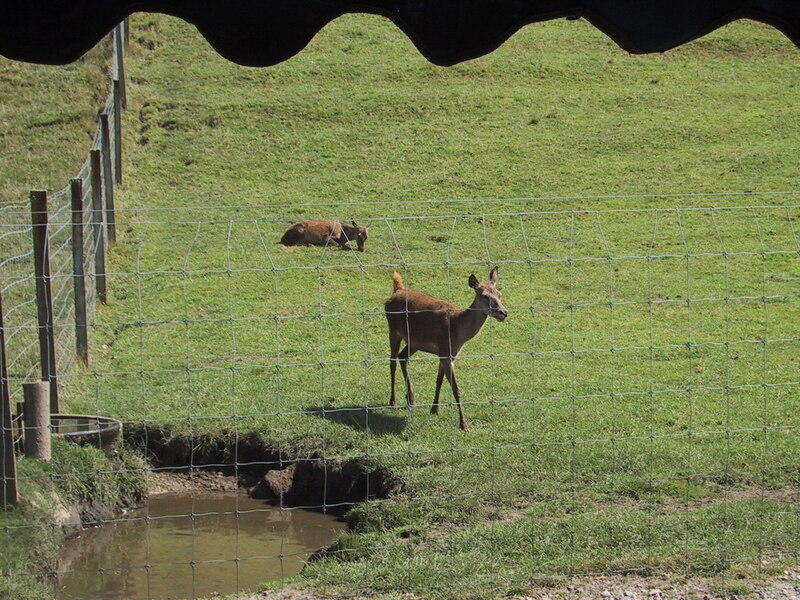 Looking down, we can see the roof of Aunt Judy's house. 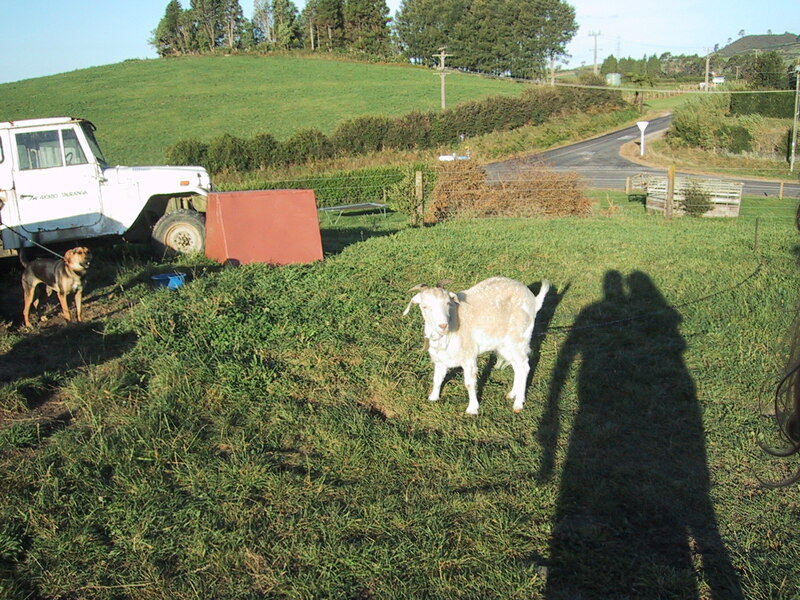 Pipi the goat blats a greeting to Alex and Richard. Zanada the cat takes to Caitlin. 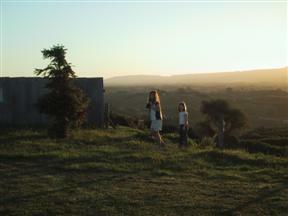 As the sun sets, the girls (and Zanada) check out the farm. 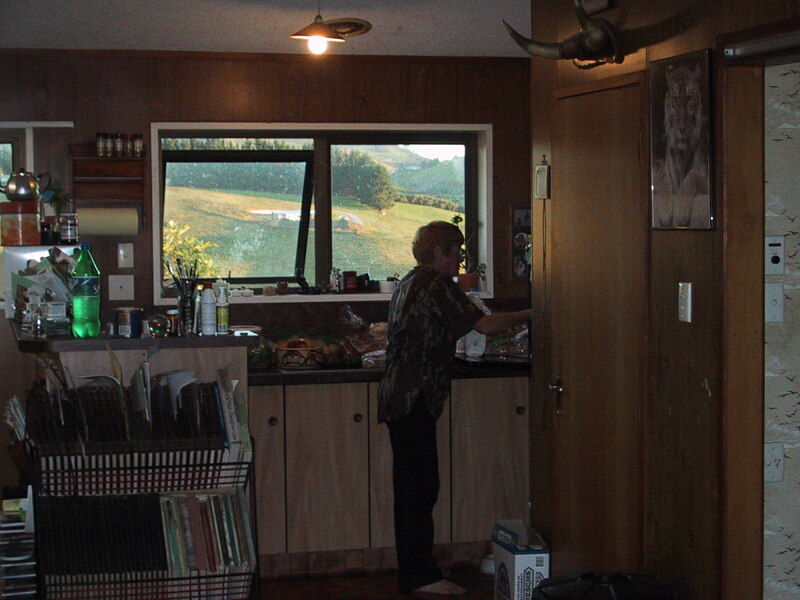 Aunt Jeanette prepares dinner. 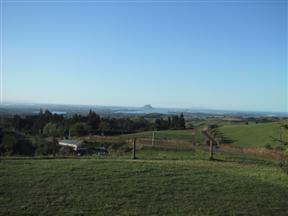 Finally half way through our vacation, we were in Tauranga with our family. 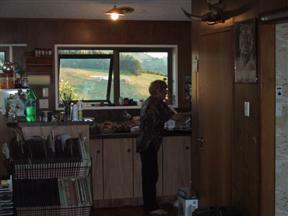 Aunt Judy and Ray came up for dinner so we all had a good visit. The next day we'd visit with more family - cousin Malcolm, Anna and little Alyssa!